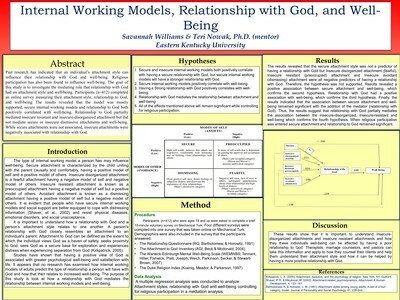 "Internal Working Models, Relationship with God, and Well-Being" by Savannah R. Williams, Jonathan S. Gore et al. Past research has indicated that an individual’s attachment style can influence their relationship with God and well-being. Religious participation has also been found to influence well-being. The goal of this study is to investigate the mediating role that relationship with God had on attachment style and well-being. Participants (n=412) completed an online survey measuring their attachment style, relationship to God, and well-being. It was hypothesized that (1) secure and insecure internal working models will both positively correlate with having a secure relationship with God, (2) Secure internal working models and (3) relationship with God will positively correlate with well-being by (4) controlling for religious participation, and lastly (5) all hypothesis will remain significant while controlling for religious participation. The results revealed that the model was mostly supported, secure internal working models and relationship to God both positively correlated with well-being. Relationship to God partially mediated insecure-resistant and insecure-disorganized attachment but did not mediate secure or insecure dismissive attachments and well-being. While secure attachments were not associated, insecure attachments were negatively associated with a relationship with God.